In a technology landscape that includes multiple options for bringing students and instructors together virtually, the University of Arkansas isn't giving up on its high-definition video conferencing. In fact, not long ago, the Fayetteville institution invested even more in products from LifeSize, its current conferencing choice, in order to enhance its distance education options. The university began its video conferencing journey on the administrative side. Each individual college or school adopted a brand of what was then called "telepresence" equipment to meet its own administrative needs -- primarily for professional purposes, to participate in meetings among administrators, faculty, and researchers at remote sites. A couple of years ago, however, as distance education grew and video conferencing began to be used not just for administrative but also for educational uses, the university began to assess its options for standardizing video infrastructure that would address multiple purposes. In summer 2012 U Arkansas implemented LifeSize Bridge, UVC Video Center, and UVC ClearSea and began talking up with users the advantages of shifting to the new campus standard. Now, although there's still plenty of Cisco/Tandberg and Polycom gear in use, about two-thirds of video conferencing is done through the LifeSize deployment. Video Center started as hardware and became a virtual appliance. It allows live streaming of up to 1,000 "points" or, in the university's case, students. "We have lecture halls that can hold several hundred students," Duncan explains. By putting Video Center into a classroom, it can more than double student participation. It also accommodates recording and playback functions and can link to Video Centers at other sites to access and share video content. A reporting feature provides video conferencing data. Duncan points out, "From an analytics standpoint, we can actually see how much it's being used, and we can see that it is growing. Just since we've gotten it on campus, the usage is starting to skyrocket." Recently, the university helped test a Blackboard plug-in being created by LifeSize that works with the institution's learning management system. When that's in use, users will be able to watch a live or recorded stream and faculty will be able to manage how and when their videos are to be viewed through the LMS. ClearSea is an application that provides for personal video conferencing. The program has already been adopted by nearly a thousand university users, Duncan claims. It works on Apple iOS and Android mobile devices as well as on standard computing gear. The use of the software allows students and others to interact in real time with the live class. Therein lays a major difference between the way high-definition video conferencing used to be used and how it's used now. Previously, dedicated rooms would be set up where meetings could take place with participants from multiple locations. Displays would be large enough to accommodate "life sized" images of people. The monitors might be set at table height to give the appearance that everybody was in the same room. Frequently, a technician would need to participate at some level in order to set up the connection and to hang up the system when the meeting was done. Now, says Duncan, his team can issue participants -- including students -- a quickstart guide and some basic connection information, and they take it from there on any of their devices. On mobile devices the connection can be done on 3G, 4G, or Wi-Fi; on desktops the resolution is 1080 pixels. In either usage ClearSea handles the firewall and network issues. No special dedicated support needed. Two academic departments in particular -- the school of nursing and the school of law -- are seeing unique pickup in the use of video conferencing. Recently, the university system moved a medical school campus to the Fayetteville location, while retaining the main campus in Little Rock. "There was a need for a high definition communication between the two," says Duncan. Nursing student s can now perform grand rounds remotely, he adds. For example, the school hires actors to perform as mock "patients" in an on-campus examination room. Students who are at their home locations in Little Rock can diagnose the problems of these patients, and the sessions can be recorded and reviewed later on. "They're able to view this in high definition and see what the problem is and communicate really well with the person that's acting like they have the medical problem," he notes. 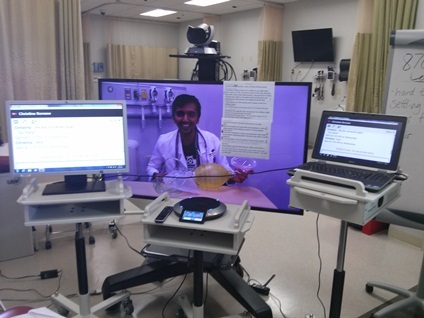 That practice enables the students to get a feel for what it would be like to deliver telemedicine. At the law school, the challenge was slightly different. In that case, several of the faculty members spend a great deal of time in Europe. The video conferencing allows them to continue teaching classes from their remote locations. "They'd have a LifeSize unit set up here in the law school classroom and they'd use whatever they had available to them on their end. They'd still be able to be in Europe taking care of their law practice there and teaching over there and teaching classes here," he explains. In this case there are just a few students in "high level" courses, some on the main campus and others elsewhere. Everybody is "just up there 'Brady Bunched' on the screen." Why Not Go with Video Freebies? In both cases, although LifeSize's Video Center provides a mechanism for saving virtual copies of meetings, Duncan says the service isn't being considered a replacement for lecture capture. The university already uses Echo360 for that, and "we've been real happy with them." The difference is that LifeSize provides the live streaming and interaction option, which isn't available through Echo360. The advantages of high-def video conferencing have been noticed by Duncan's IT organization too. The university acquired a branch office that's about 20 or 30 minutes from the main campus, he explains. "We have two endpoints there, and we're constantly having meetings back and forth with those guys since they got moved off campus." Why not just use video conferencing services such as Skype or Google+ Hangouts? After all, these also provide a measure of interactivity and are free. "Really," insists Duncan, "it's the reliability and the high definition signal. If you compare the quality of the audio and the video of LifeSize over some of the non-commercial solutions, that's really the advantage." He points to conferences done in sites in Iraq and other places in the world that may not have fast connectivity. In those places, the LifeSize service automatically "throttles down" to work with whatever bandwidth is available. "Most of the time people are really happy with the video quality. It's surprising how little lag you get with some of the long distances we connect to." Contrary to what might be expected, the use of video conferencing hasn't really affected class attendance. "We've been using classroom and other video capture on this campus for the last four or five years," Duncan notes. "Our initial thought was that attendance would decrease. But it's turned out not to have much of an effect on it all. The students really like the video option. If they need to rewatch it because English is their second language or it's a difficult subject, that has been really beneficial." It's time for high end video conferencing to be "seriously looked at," Duncan concludes. "It's been a great administrative tool for a long, long time. But I think finally at the price point it's at now, it's something to look at seriously for implementing distance education.